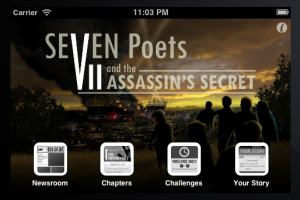 Today we get to finally announce our latest project, created in partnership with Edmund Pevensey in America: Seven Poets and the Assassin's Secret, a real-time, serialised adventure story for iPhone, iPad and iPod touch. Seven Poets was our first project coming out of Frankenstein and in some ways, it couldn't be more different. For a start, it's not an inklebook - it's not a branching narrative and there's no game-logic, no adaptive storytelling. But it is a novel reshaped in a way that suits these strange, super-connected, multi-functional things we all carry around in our pockets. And so we've been solving a lot of the problems we wanted to solve on Frankenstein - how do you keep a reading coming back when the screen they're looking at has the entire internet inside it? How do you make the book become a personal thing, digitally dog-eared as the reader turns the pages? It's been a tech-heavy project to get it made, too. The author, Matthew A Brown, and his team at Edmund Pevensey are based in Texas. We've never met, except over video-conferencing, and we've done all our collaboration over the internet, across a permanent time-difference. There are plenty of international game studios that work like this, non-stop, all the time: we hadn't quite expected to be doing it ourselves so early on! The app is built in four main sections - two are about story-telling, and two are for recording your own progress through the story. The author had a clear idea about getting a light gameplay element from the novel and into the reading experience, and we've worked with him to design something that's elegant; something between double-dare and keeping a diary. The team behind Seven Poets have strong ambitions about where they want to take this story, and are running a Kickstarter project to fund it. If you want to take a look, then please do. Otherwise, we've got some servers to tighten.